Having a fascination with weather, I have always enjoyed seeing time-lapse movies of the sky, and having recently acquired a camera capable of doing this, I jumped in and started making some myself. Here is an example that I uploaded to Youtube. I recommend that you view at maximum resolution possible (720p). However, there are many factors involved in making such a movie, and it requires not just the right equipment, but also quite of lot of attention to detail. It obviously helps to have a technical bent to start with. The camera I have is a Canon EOS 550D. This is a digital SLR. Although this camera is able to take HD video footage, creating time-lapse videos does not involve using it in video camera mode. Rather, what you have to do is to take a series of timed individual photos, and only after the whole sequence has been taken do you perform the final steps to assemble to individual shots into a movie using software on your computer. The camera must not move during the filming, which may last several hours of more. I use a tripod to do this – and take care not to move or knock it after the photo shoot has started. If filming through a window, make sure the glass is clean, and keep the camera as close as possible to the glass. After my first couple of efforts I noticed some blotches on the movie which were only visible when watching the playback – they weren’t at all apparent until there was coud movement happening behind it. If filming through a window, minimise all possible reflections. Cover or block or reduce all other light sources in the room if at all possible. Again, on my first efforts I noticed some reflections which only became apparent when watching the playback. That can be frustrating if you’ve spent several hours recording before you see it. The shutter timer control must be automatic or by remote control, as touching or adjusting the camera during shooting will inevitably move the framing and cause jittery movements in the final video. 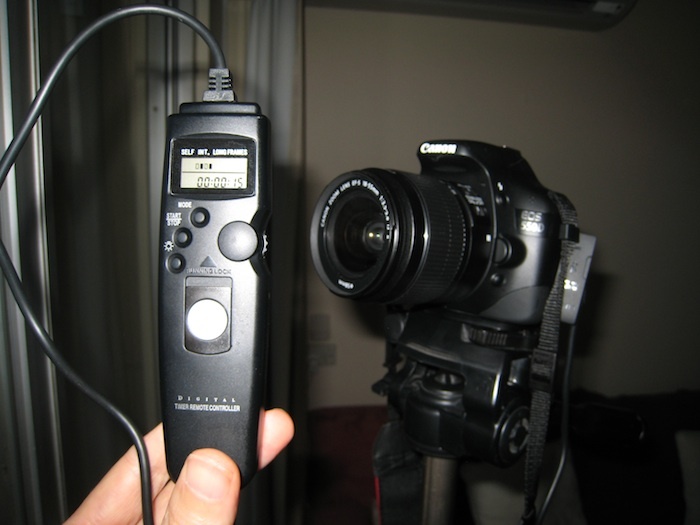 The camera came with software which allows this to be done by connecting the camera to your computer by USB cable, and then setting up the utility software to take shots at the required interval. I used this initially, and it worked well enough, although it requires you to keep your computer running the entire time of the shoot. Later I bought a separate battery-controlled timer device which plugs into the camera and is a much more lightweight solution (shown in photo above). The camera’s auto-focus control cause the picture frame size to change by small amounts. For my first effort I left it on, and the picture jumped in size a lot – not a good result. Make sure you focus the camera before you start the shooting (for example by half-pressing the shutter button), then set it to manual focus. Depending on what you are shooting, you may or may not want to let the camera automatically adjust to light changes. For weather time-lapse I have found that automatic camera operation works quite well. However, for sunrise or sunset time lapse not quite so well, because as the camera adjust for light levels, the impression of increasing/decreasing light levels are somewhat lost. Unless you have a power supply connected to your camera, the number of pictures it can take will be limited by how long the battery lasts. I have found that I can take about 1500 pictures or so with one full battery charge. If you render your finished video at a fairly standard 24 frames per second, this will result in a maximum duration of about 60 seconds for a single video sequence. Changing the battery will definitely interrupt the sequence, and very likely also cause the camera’s viewpoint to shift noticeably too. If you want more than this then you could buy a battery shoe, or if you are shooting from indoors you could consider using an external power adapter – both of which require you to purchase optional add-ons, and are not necessarily cheap. Before you start shooting, set your photo resolution mode to low. You may be taking thousands of pictures, and unless you want to treasure and reuse every last frame, there is no point having each photo consume 20MB disk space when it might only 0.5MB might be necessary. On the Canon 550D, the smallest picture resolution (“S”) is 2592 x 1728, which is more than even full HD video requires (1920 x 1080), and using anything more than this will simply be resized down during video rendering phase anyway. If you want your final movie to be in HD format, then the photos you are taking will likely have to be cropped at the top and bottom. 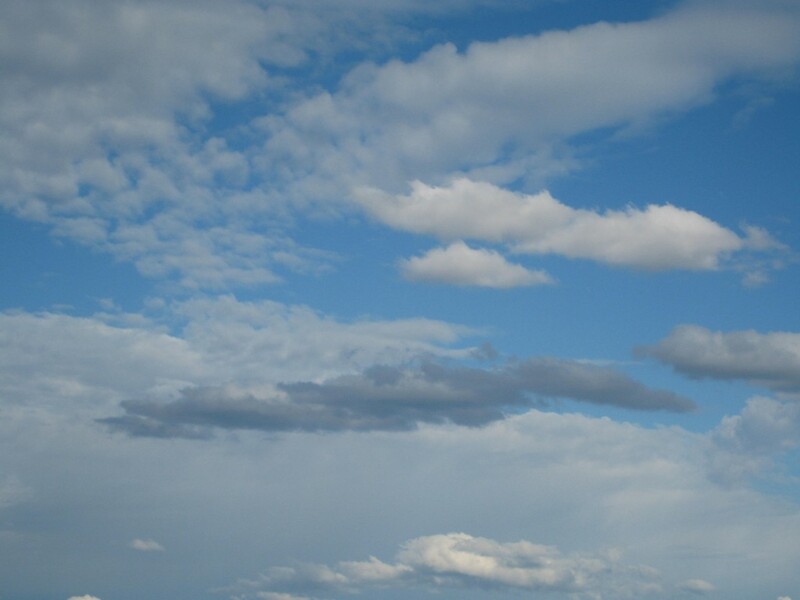 HD format has an aspect ratio (width:height) of 16:9, whereas the Canon photos have a ratio of 3:2. This means that my photos all lose 15.625% of their height, split evenly between the top and bottom (ie. “letter-boxed”). When setting up your shot there is no tool for visualising this – you just have to estimate and hope you get it right. I like to have the horizon/skyline visible in my weather time lapse videos, so I need to make sure that I am allowing this to be seen within the letter-boxed area. I used Time Lapse Assembler (Mac, freeware) although apparently it would also be possible to use Quicktime Pro (paid license required). Video codec – I have always used h.264, which is good for YouTube, for example. Framerate – Standard frame rates would be 20, 24 or 30 fps. I typically choose 24 fps. Dimensions – This is where you can choose what size your movie will be. I typically have the resize option on, and also scale proportionately on (to avoid distorting the images). In this case you can only specify the width desired, so to get a particular desired height (eg. 480, 720, 1080 which are standard Youtube sizes) you need to know your photo aspect ratio and calculate the required width to enter. For example, my photos have a 3:2 aspect ratio, so to achieve a height of 720 I would need to specify a width of 1080. Quality – I experimented with this setting, and generally use “High” for viewing the video on my own computer. However, this may also depend on what type of subject you are filming. I find, for weather time-lapse, that the image detail is important. If you have a less demanding subject then lower settings may also be ok, and this will result in smaller video file sizes. 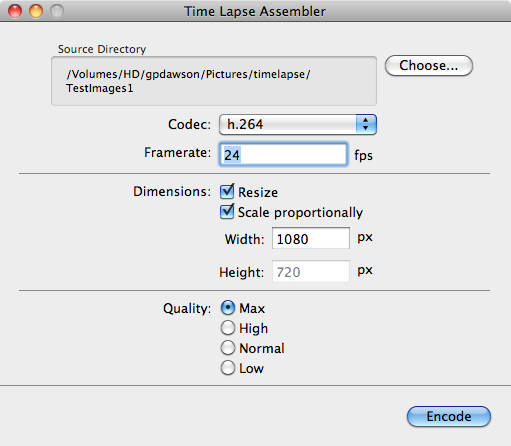 Note that, as far as I can tell, Time Lapse Assembler doesn’t allow you to crop your photos to fit HD format. Instead it only resizes the images, retaining their original aspect ratio (if “Scale proportionally” is on) or else distorting the image the fit the desired aspect ratio (if “Scale proportionally” is off). However, there are other ways of achieving this. For example the Mac has a built-in tool called “Automator” which does allow you to build a script that will crop all the photos for you automatically, which you can use as a step before you use Time Lapse Assembler. A final step (optionally) is to edit your raw video and compose it into an edited masterpiece using some kind of video editing software. If you only want to do basic editing such as adding titles and a music track, as I did in the video shown above, you can probably use whatever video editing package came with your computer. I used iMovie. Of course this requires a whole new level of learning, and it is beyond what I wanted to relay here, but at least you can know that a novice such as myself didn’t find it too hard to arrive at a simple, but fully finished product. We’ve had it drummed into us our whole lives that there are five senses. We all know what these are! However, is that the end of the story? No, of course not. As with most commonly accepted facts, a closer look reveals that things are not quite so straightforward, as pointed out in the following extract from the Wikipedia article for “Sense”. There is no firm agreement among neurologists as to the number of senses because of differing definitions of what constitutes a sense. […] Humans are considered to have at least five additional senses that include: nociception (pain); equilibrioception (balance); proprioception and kinaesthesia (joint motion and acceleration); sense of time; thermoception (temperature differences); and possibly an additional weak magnetoception(direction), and six more if interoceptive senses are also considered. So that makes for a count of 17, so far. On top of these, there is also the frequently referred to, but little understood, sixth sense. It is called the sixth presumably because it is based on the assumption that there are only the five others to start with (rather than 17 or more), and is generally considered to mean “extra-sensory perception”. This is usually considered to relate to the paranormal, but a more straightforward interpretation is that it means sensing with the mind rather than via a physical sense, and therefore refers to the everyday experience of the sensing or perception of our own thoughts. After all, who could deny being aware of their own thoughts, even though they are obviously not sensed through any of the traditional senses. And thus we arrive at 18 senses. However, despite this surprisingly high number of supposedly separate senses, do we really experience 18 different types of things? I very much doubt that anyone would actually be able to keep track of which particular sense is responsible for any given feeling / sensation / perception at any given time. My own experience, and I suspect the experience of everyone else is that there is really only one experience, regardless of which supposed sense it comes through. Rather, everything happens seamlessly in our consciousness. I might be having a conversation with someone in a crowded room, and there are all manner of perceptions occurring together – the sounds of their voice, of my own voice, of other people and things in the environment, the smells, the bodily sensations of balance, movement, temperature, my thoughts etc. All these things are occurring simultaneously, and although my attention may wander at times from one to another, or sometimes include several or more things at once, there is never any experience of things being disjointed, or as coming via different mechanisms. Rather it all runs together – a single ongoing, evolving experience of the whole thing. So when it comes down to it, although we may use our minds to discriminate and categorise various senses, direct experience demonstrates that there is really only ever ONE sense, which might be called the sense of awareness – or even just awareness itself. It has occurred to me that for much of my life I have done nothing but copy the behaviours of other people. It is as if I were an empty vessel, with no contents of my own at all. And in confirmation, if I look deeply within, beyond the ever-changing thoughts, feelings, sensations, I can find no “thing” at all. Just an empty presence, which observes, which is aware. In early life this copying was of course almost entirely unconscious. There may have been instinctive responses and behaviours, but a combination of fascination, fear, enjoyment, horror and engagement with the people around me led me to mimic them, repeat them, and then apparently somehow adopt many of their behaviours as my own. At a later stage, the copying became more selective, although still largely unconscious. There was some discrimination between behaviours which I found appealing, interesting, inspiring, beautiful, as opposed to those that were ugly, painful, inefficient, unnecessary. And there was a desire for, and an attraction to the more refined behaviours, which then presumably started little by little to manifest more in my own behaviour, and led to a more gratifying response from the world from the actions I subsequently took. Now the process is much more conscious, and there is less inner resistance to it – perhaps because I recognise the illusion that I am actually anything tangible at all, and if I am not anything tangible, then there is no obstacle, no limitation to the ways in which I may express myself. Thus the delight of discovery of a special quality in someone becomes immediately a known new potentiality in my own behaviour. The ultimate conclusion of this process, it seems, is to offer no resistance at all, to surrender completely any illusion of selfhood, and to recognise the oneness of us all. “My” qualities are not my qualities at all. But neither are they “Yours”, because you copied them too! Rather, all qualities are inherent in us all. This is yet another pointer to the essence of non-duality. I chose the 9km bridge run, along with about 16,000 others – across the harbour bridge and then through various parts of the city, ending up at the Opera House. It’s a fantastic way of seeing the city in a new light. It’s almost as if the city was being re-possessed by the people who live in it, rather than cars, trucks and buses that normally pound the streets without respite. My run went surprisingly well. It was a fairly flat course, in fact ending at a slightly lower altitude than it started at, and I managed to maintain a nicely consistent pace the whole way. The result was my fastest paced run of this distance since I was in my twenties, I believe! Here is a map of the course from the RunKeeper iPhone app. Consciousness and Awareness – What’s the Difference? If you are seeing this picture and understanding what it represents, then you are conscious. This is an indisputable fact. The knowledge of your own consciousness is the one and only fact of which you can be absolutely certain. Everything else that you might think that you know is an inference or assumption, and therefore cannot be known with certainty. Consciousness is whatever is reading these words right now, and understanding them. This is an experiential definition, and it seems to be necessary to define it this way because consciousness is not a “thing” or object per se, and therefore cannot be defined in terms of other things. Our minds simply cannot grasp the nature of consciousness, because of its lack on tangibility. Hence it can only be pointed to. And yet, it is apparent that consciousness is what we are ourselves. Whenever we refer to “I”, it is this very same consciousness to which we refer. So in the scheme of things, it seems important that we understand it! An interesting point to note is that, according to Lucille’s definition (and also as he has pointed out himself), there is no distinction between consciousness and awareness. The two words are treated synonymously, and are used interchangeably. Those of you who have an interest in non-duality will likely also have come across Sri Maharaj Nisargadatta. (A famous book documenting some of his discourses, I Am That (PDF), is available as a free download.) Nisargadatta spoke extensively about consciousness, but he also referred to awareness and made a distinction between the two. The following quote from the book illustrates this especially well. What you need is to be aware of being aware. Be aware deliberately and consciously, broaden and deepen the field of awareness. You are always conscious of the mind, but you are not aware of yourself as being conscious. But what exactly is the distinction here? This caused me some confusion, and apparently it has confused others too. The easy way out here might be to remember that we are talking about the intangible, and just paper over the cracks by suggesting that it’s not surprising that there would seem to be inconsistencies between intangible things when we try to conceptualise them. But in fact on further investigation there my be some rationality in the distinction after all. These further quotes from Nisargadatta may make things a little clearer. The mind produces thoughts ceaselessly, even when you do not look at them. When you know what is going on in your mind, you call it consciousness. This is your waking state — your consciousness shifts from sensation to sensation, from perception to perception, from idea to idea, in endless succession. Then comes awareness, the direct insight into the whole of consciousness, the totality of the mind. The mind is like a river, flowing ceaselessly in the bed of the body; you identify yourself for a moment with some particular ripple and call it: ‘my thought’. All you are conscious of is your mind; awareness is the cognisance of consciousness as a whole. Awareness is primordial; it is the original state, beginningless, endless, uncaused, unsupported, without parts, without change. Consciousness is on contact, a reflection against a surface, a state of duality. There can be no consciousness without awareness, but there can be awareness without consciousness, as in deep sleep. Awareness is absolute, consciousness is relative to its content; consciousness is always of something. Consciousness is partial and changeful, awareness is total, changeless, calm and silent. And it is the common matrix of every experience. So the distinction that Nisargadatta is making appears to be between a mental/bodily consciousness (ie. our thoughts and sensory inputs) versus a broader awareness which extends beyond mentations and sensations. And this does appear to have a parallel with Lucille’s description of perception versus apperception (mentioned, for example, here). Therefore I propose the following simple explanation of the distinction between consciousness and awareness. Having sorted out that little conundrum to the (hopefully not overly smug) satisfaction of my own mind, the next question is what an apperception is, and how on earth we can be aware of something that is not within our own mind or body? Ah the joys of non-dual investigation! This year’s Sydney 14km City to Surf race was once again the largest in the world, with 80,000 registrants. It was another cool but sunny day – great running conditions, although waiting around at the start gets a bit chilly. This was more than 2 minutes slower than last year. I can’t say I’m sure why, because my training has been quite similar in distance and intensity to last year’s, in most ways. So although I’ve been running as a hobby for more than 25 years, there are still some mysteries in the way my body behaves! But once again it was a memorable occasion. People were extra friendly on the day, and I chatted to several complete strangers. This is the delight of a shared, special experience. 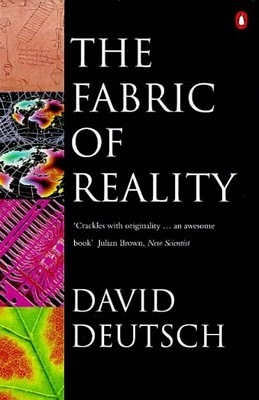 In his book “The Fabric of Reality”, renowned theoretical physicist David Deutsch describes a world view that he arrives at through a deep and thoughtful consideration of quantum physics and the theories of knowledge, computation and evolution. It is a fascinating read, and demonstrates some of the clearest, most rigorous and elegantly argued thinking I have come across. One of the concepts he explores in some detail is virtual reality, and one of the conclusions he comes to is that it is not possible for us ever to know with certainty whether or not we exist in an externally controlled virtual reality simulation. As a summary to one the chapters of the book, he says the following. Virtual reality is not just a technology in which computers simulate the behaviour of physical environments. The fact that virtual reality is possible is an important fact about the fabric of reality. It is the basis not only of computation, but of human imagination and external experience, science and mathematics, art and fiction. And from this, the essential point I would like to extract is that he is saying that virtual reality is the basis of human imagination and external experience. If you have any argument with this point, as you may well do if you have an active and enquiring mind, then I highly recommend that you read the book to see exactly how he reaches this conclusion. It is quite compelling. There is a very interesting overlap with the teachings of Advaita (non-duality) here. One of the tenets of non-duality is, of course, that any experience of duality that we think we may have is illusory ie. imaginary or dreamed. And here we have a scientist whose world view seems to be compatible with this, despite the very widespread belief system that reality is external to and independent of ourselves, and that our perceived reality is not virtual. The wonderful thing about this is that he arrives at this conclusion through a careful and stringent consideration of the facts of our existence and experience, and attempts to avoid all assumptions that the less disciplined thinkers amongst us would normally make. And what this seems to demonstrate is that through the attempted use of pure reason, a physicist and a spiritual enquirer may well come to similar, if not actually the same, conclusions about the nature of reality itself. Indeed, the Advaita teachings indicate that the main obstacle to the much sought “enlightenment” experience (the experience of the deeper truth of reality, rather than the dream), is our own ignorance ie. due to false beliefs we hold about the nature of reality, as a result of our failure to question and explore the reality of our own experience more deeply than we already do. So apparently, the requisite questioning and exploration can apparently be either of a spiritual nature (for example, by a thorough and persistent investigation of who you are or what you may be) as carried out by the sages of the world, or it can be purely scientific, as carried out by the more advanced scientists, such as David Deutsch. From someone with a strong interest in both of these approaches, it is inspiring to see such a rapprochement! In the quest to know ourselves, it is likely that, at some stage or other, we will attempt to observe our own thoughts. Indeed, doing so is central to most techniques which purport to lead to self-realisation. After all, much of our lives appear to be dominated by our minds, and although we have physical senses, our experience of them is typically interpreted continually by the mind. So clearly, any insight that we can obtain into thoughts and thinking will be key to self-understanding. Having undertaken quite a lot of meditation myself over the years, I have gradually come to get a sense of what goes on in my own mind, and I am expressing here conclusions based on my own experience. The first observation I have is that thoughts appear to come to me more or less instantaneously. 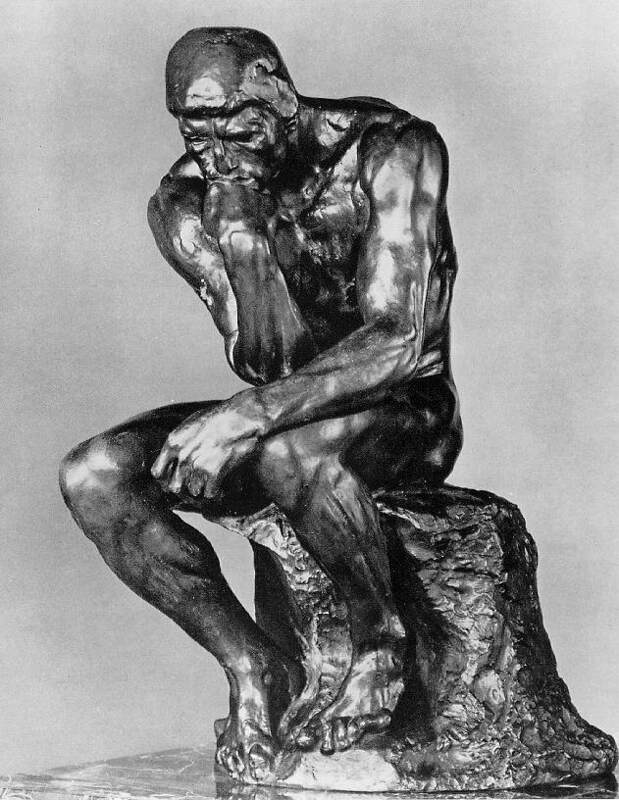 I am unable to identify anything that I could reasonably call “thinking” which takes any length of time. Rather the thoughts just arrive or occur (as in the expression “it occurred to me that”). It is true that there is a time-based element in what happens subsequently. For example if I want to express the thought verbally, this process takes some time. However, I am not necessarily actually thinking while I speak. Rather I am just holding the memory of that thought and transcribing it. During that process I might realise (ie. have another instantaneous thought occurence) that a word that I was about to use could be improved with the substitution of another. So I can have another thought occurrence while the memory of the original thought was still there. But it appears to me that this is still not really a process of thinking per-se, but rather the subsequent occurrence of further related thoughts. So while the talking may appear to be continuous, there is no continuity in the process that fuels it ie. no “thinking” process. An apparent contradiction here is how I can appear to be able to string coherent, related sentences together. Would that not imply some kind of thinking process going on? I suspect that can be explained by the fact that when I focus on a particular topic, for example, the thoughts that occur to me do usually relate to that topic, and to one another – and the reason for that is because I am filtering thoughts ie. choosing to ignore or disregard any thoughts which are not relevant, which gives the impression that only relevant thoughts are occurring to me at all. It is a matter of where I am putting attention. In those cases where extraneous thoughts do also appear, they are usually ones triggered by some form of sensorial input eg. I may hear a sound, or see something that apparently triggers a “distracting” thought. However, might it not be the case that all that happened here was that the change of attention from the topic of discussion to the distracting sound/sight simply caused my focus to change, and hence be receptive to thoughts relating to the distraction rather than the original topic? The conclusion that we don’t actually “think” may seem contentious, as it seems to imply either a lack of individual control over our thoughts, or that there is no personal creativity involved. However, I cannot deny that some of the thoughts that occur to me are creative ones. They can at times be funny, inspiring or even beautiful, for example. But if they appear instantaneously in my mind rather than being constructed by me in some kind of process, then what actually created them, and can I really take personal credit for them? This kind of self-questioning is central to the teachings of Advaita (non-duality). The results of such enquiry may seem to go against common sense, but unless you are actually prepared to question what is commonly accepted as true without question, then can you be sure that it is?! I am hardly a poet by any stretch of the imagination, but on one or two occasions in my life I have never-the-less been inspired enough to put pen to paper. The following expresses what I was feeling whilst I was preparing to leave Adelaide, after having lived there for 18 years – a very meaningful phase of my life. It still brings a tear to my eye, each time I re-discover, re-read it, and re-remember everything and everyone who made it so special to me. 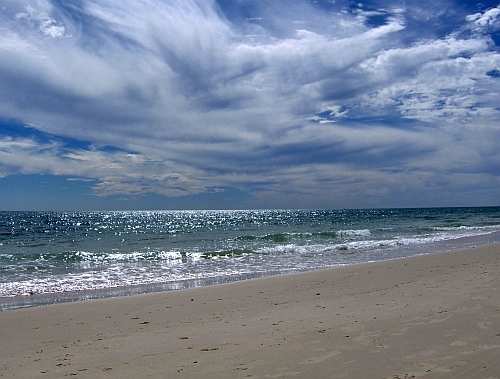 The photo is one I took myself one Easter, just south of Adelaide, South Australia. There is a common thread amongst spiritual teachings of various origins that suggests that we should seek to still our minds in order to see the reality that our incessant thought stream prevents us from seeing. What would we see if we were able to detach ourselves from our thoughts, our memories, our imagination, our desires? The usual experience is that it is very hard to just stop thinking, beyond a few seconds at least, and that isn’t normally enough to be able to experience anything much different from our normal state of being. Even in meditation it can take extensive practice to achieve any degree of mental stillness. So how do we know if the effort involved would really be worthwhile? Fortunately there are some transient things that can give you a taste of this state. One of these happens to us every day – waking up. When we awaken naturally (as opposed to an abrupt awakening by alarm, for example), there will often be a brief, perhaps just very brief, moment upon awakening when we become conscious and have an awareness of self, but our memory of who we are, where we are, or what our current life circumstances are haven’t yet fully arisen. Unless we are awakening from unpleasant dreams, this is usually experienced as a pleasant, perhaps even blissful state. It is only when the memory of “who we are” or what our circumstances are returns that we resume our normal life attitude, which is usually a mixture in various proportions of anticipation of, and memory of, pleasant and unpleasant experiences. Another one is a little less common – but many people may experience it once in a while, and in my own case rather often. This is when you nearly lose consciousness due to lack of blood flow to the brain. This occurs to me often, mainly when getting up suddenly after sitting down for long periods. This is know as orthostatic hypotension. The exact nature of the experience varies from occasion to occasion, and although it almost never leads to a full loss of consciousness, it does lead to a partial loss of self-identity, and/or awareness of immediate circumstances, typically for several seconds or so. I usually find this to be an oddly deeply pleasurable experience, and it seems I am not alone in this as the Wikipedia article mentions “euphoria” as a possible symptom. I certainly don’t try to provoke it happening, and always take preventative measures (bending over, lowering my head) as soon as I feel it starting, as I do not want it to lead to a loss of consciousness, the after effects of which are not very pleasant at all. However, what I am suggesting is that what is at the root of the pleasure in this experience, is the halting of thought and hence forgetting of the self that occurs. Due to the recent re-invigoration of my meditation regime, I have managed on a few occasions to substantially reduce my thought activity for a time, and the feelings/sensations that came with this were not dissimilar to those that I experience from the other circumstances I’ve just described above – perhaps not quite as intense, but definitely of a similar nature. So there certainly appears to be a pattern in this – and the suggestion that it is our own minds and egos that stand in the way of a blissful existence is looking very plausible, to me. So while the spiritual teachings beseech us to know ourselves, and we might assume that means to know our own personalities and minds, I would suggest that what it actually means it to know ourselves beyond our personalities and minds. So who are you when you stop thinking, and stop imagining yourself as a personality? It may take some courage to let go, but it seems that there is real joy to be had from no longer knowing who you are – or at least who you thought you were, and instead experiencing yourself as pure awareness and being.